Good question! What determines the size bike you need? Pretty easy to figure out that the answer must be choice 5, all of the above. That’s why, if you’re looking at a bike on-line or on Craigslist, visiting a shop to find out “What size bike do I ride?” won’t get you even a quick & dirty answer. Especially since different brands size differently from one-another. You’re not simply a 56 or 58cm bike (more on that later). So when a shop seems reluctant to answer “What size bike do I ride?” they’re not trying to be rude, but really they just don’t know without going through their fit process, setting you up and observing you on the bike and possibly making various changes to it so it’s comfortable and efficient. It’s time-consuming, requires a good deal of expertise and training to get right, and a huge assortment of handlebars, stems, seats & frame sizes. People coming in expecting that to be a free service offered by dealers to help people buy bikes elsewhere continue to surprise those working in bicycle shops. Mike J (left) & Mike F (right), almost identical in height. Mike J rides a 60cm H1 Trek Madone 6.9, Mike F a 56cm H2 Madone 5.5. Very different seat heights, drop from seat to bar and forward reach. They could only painfully swap bikes in an emergency. Bike “size” is a whole series of numbers that add up to something that fits you. People aren’t generic, as you’ll read below. The only thing you can quickly tell from this photo is that Mike F is better-looking. Even something as simple as jeans aren’t described by a single size designation. SM/MD/LG/XL for jeans or for bikes, 50/52/54/56/58/60/62/64cm, isn’t enough. Think of buying jeans. You’re 6 feet tall. What does that tell you? It just tells you that you’re 6 feet tall and not going to fit something appropriate for someone 6″ shorter. But that’s all it tells you. Just like a bike. Height gets you in a general range but it doesn’t get you jeans, or a bike, that fits. 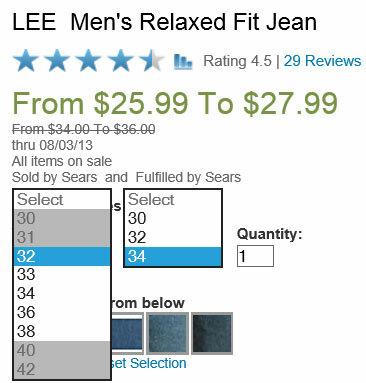 Jeans might come with a 32 to a 35″ inseam, based on leg length. So you’re looking at some 34″ inseam jeans, on sale no less, the perfect length. You’re there, right? Not if you weigh 180 and have a 34″ waist but those jeans have a 32″ waist! But you already have Sears jeans that are 34″ inseam and a 32″ waist so you just bought some Levi’s on line in the same size… and they don’t fit right! Just like bikes, different companies size differently. Hate that. How important is getting the right size bike, and then further having that bike adjusted, using different stems, handlebars & seat masts? It’s the difference between jeans that fit right and jeans that you’d want to avoid wearing at all costs but everything’s at the laundry so you have no choice. A bike is going to be with you a very long time, especially a high-quality bike. If you want something that you can’t bear to walk past in the garage without wanting to get out and ride it, getting it properly sized and fit is essential, and it’s going to take some quality time with the bike itself. You can’t look at something on the ‘net or Craigslist and say yes, that’s going to work perfectly for me, unless it’s the same brand and model you had before, and you’ve got all the setup measurements. Nor can you expect to walk into a shop and ask them “What size bike do I ride?” and get an answer that’s much better than a guess unless you’re willing to pay them for their time and expertise to go through the process they use when they actually sell a bike. This is why we have some models that come in 10 “height” sizes, and then further variations within those sizes that account for the range of handlebar height and reach from seat to handlebars. And it’s why “standover height” (room between your crotch and the bike’s top tube) is virtually meaningless. And, of course, this is why it’s so important to find a really good shop that cares not just for how their staff members ride, but how you will ride, your ambitions and dreams, your desire to get out there and enjoy the world at bike speed even if, perhaps especially so, you don’t think you look good in lycra. Can you “adapt” to a bike that doesn’t quite fit well? Sure. I see people out on Canada Road all the time on bikes that don’t come close to fitting them right, and they’re out there riding. But for how long? How much are they missing when they have to force themselves into the bike’s shape, rather than have something that fits like one of James Bonds’ tailored suits, something so comfortable you might find it easier doing a 7 hour bike ride than a cross-country plane trip? People are wasting a lot of money trying to save a few dollars, and really missing out on what riding can be like. You are not “a” 56 or 58cm road bike. But you might be an 88cm seat height with a top tube plus stem measurement of 63cm, with a drop from seat to handlebar of 3cm, 42cm handlebar width, and a 7cm setback from the nose of the seat to the bottom bracket spindle. And that might be a 54cm bike in one line, a 56cm in another, and impossible to achieve in a third brand. Me? I’m a 60cm H1 Trek, 76.3cm seat height (measured top of seat to center of bottom bracket), 8.5cm setback (distance tip of saddle is behind the bottom bracket, measured with a plumb line), 5.5cm drop from top of seat to top of handlebar, 57cm reach from tip of saddle to center of handlebar, with 44cm bars. Mike F? 56cm H2 Trek, 79.2cm seat height, 9cm set back, 12cm drop, 59cm reach and 42cm handlebars. Like it says underneath the photo at the top of this entry, there’s no way we could swap bikes, even though we’re within millimeters of the same height. Burt on Most-torturous-flight ever? Finally home, get to ride my bike Sunday! Mike on TrekCarePlus FAQ- Affordable Wear & Tear & Accident Coverage for your new Trek!